Designers are guided on evaluating how the integration of photovoltaic modules on building affects the roof’s fire performance characteristics. The National Building Code of Canada (NBCC) requires roof coverings regulated under Division B, Part 3, to have a Class A, B or C Classification to protect the roof covering material from ignition in the event of a roof exposure fire originating from sources outside a building. Guidance related to the requirements in ULC 1703, CSA C22.2 No 61730-1 and 61730-2, and CAN/ULC-S107 is included. Pre-cautionary steps related to stand-off ounted photovoltaic systems as they relate to the NBCC classification are also noted. For direct or indirect lightning strikes, SPE-900 provides precautions for surge arrestors and lightning protection in buildings where there is a critical nature of the power distribution system. Since the design and installation methods used in installing a photovoltaic system can help reduce the level of risk associated with lightning-induced surges, design considerations related to AC wiring, module wiring (string and parallel string) and power cabling are included in the guideline. Precautionary information related to the strength and bonding for the racking is also covered. climbing and avalanches are also included. guidance throughout the industry for safe installation. At the time of publication, based on a scan of Canadian and international building codes and guidelines, the structural clause in SPE-900 resulted because there were few, if any, specific requirements related to roof-mounted photovoltaic modules and racks. Therefore, the largest section of the guideline is related to structural design. The publication’s structural guidelines provide interpretation of existing code provisions and best practices for the structural engineering aspects of roof-mounted solar photovoltaic systems for new and existing construction. 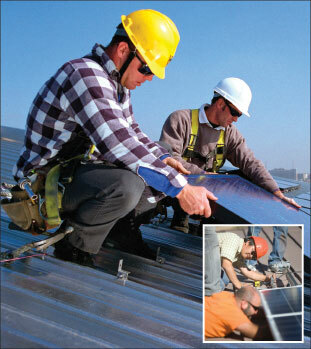 When a solar photovoltaic system is installed on a rooftop, it is important that it be designed to resist dead, live, and other loads, and to recognize that it influences the loading conditions that the building would otherwise have been designed for in the absence of the photovoltaic system. 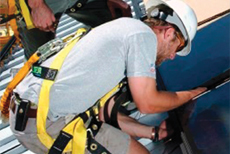 SPE-900 helps ensure that a rooftop installation of a solar photovoltaic system be designed to resist dead, live and other loads, and to recognize that it influences the loading conditions that the building would otherwise have been designed for in the absence of the photovoltaic system. Because the NBCC doesn’t explicitly define loads on photovoltaic systems, nor its influence on the building loading defined, detailed consideration for dead loads is included. The guide includes consideration for the design and structural resistance of photovoltaic modules and racks. Because it was noted that sliding and overturning problems are unique to ballasted racks, a section with best practices for the design of such systems is included. Designers are provided with information for various types of building components including wood frame, prefabricated wood trusses, open web steel joists, steel frames / decks, concrete suspended slabs, hollow core precast slabs, etc. SPE-900 also discusses waterproofing and the durability of photovoltaic integration on commercial roofs before, during and after installation to minimize any unintentional adverse effects due to the waterproofing functionality of the roof assembly. Because solar photovoltaic electrical issues are addressed by the Canadian Electrical Code Part I, Section 50 and Section 64, SPE-900 does not duplicate these requirements, but rather points the user to the relevant sections of the Code. Likewise, the guideline does not include aspects covered in National Fire Protection Association (NFPA) 70, Article 690. As always, local authorities having jurisdiction are the touch point for electrical and structural permit requirements for photovoltaic rooftop installations because specific requirements may vary by jurisdiction. As a future development, CSA Group has worked with stakeholders and is evaluating the need to develop the SPE-900 into a standard for photovoltaic installation for rooftop and ground mount. In evaluating this opportunity, CSA Group would look into any existing documents related to fire and building construction so that conflicting requirements are avoided. Muktha Tumkur, P. Eng., Program Manager of Renewable Energy. Victoria Alleyne is project manager, Renewable Energy, CSA Group.